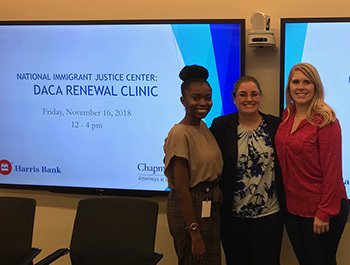 Attorneys at Chapman partnered with attorneys and legal professionals from BMO Financial Group (through their Pro Bono program) to draft renewal paperwork for individuals whose Deferred Action for Childhood Arrivals was up for renewal. Led by and supervised by an attorney from the National Immigrant Justice Center, Chapman and BMO volunteers were able to help fourteen young people put together applications to renew their DACA status. Learn more. We use our Pro Bono symbol to raise awareness for the pro bono opportunities within the firm and the work we do on behalf of nonprofit organizations and disadvantaged individuals outside the firm. Cabrini Green Legal Aid (CGLA): CGLA provides free legal services to low-income Chicagoans. Through CGLA's program, Chapman attorneys volunteer at the CGLA Help Desk, where we meet with clients to assess their options, under Illinois law, for clearance of criminal records. We also then represent sealing and expungement petitioners at criminal court. Further, Chapman attorneys have represented numerous clemency clients before the Illinois Prison Review Board. For the clemency petitions, our attorneys interview the clients, review their criminal records and other relevant information, prepare the clemency petitions, and then represent the clients in a public hearing before the Prisoner Review Board. TMC Working Development Solutions (TMC): TMC is a nonprofit organization committed to serving start-up and existing businesses through the nine San Francisco Bay Area counties, particularly those businesses owned by low-income individuals, women, and minorities. TMC provides business loans of between $5,000 and $50,000, business coaching, advising, education and mentoring, referrals to free and low-cost business resources, and presentations on access to capital. Chapman attorneys assist TMC in documenting loans to a wide range of micro entrepreneurs, including a gourmet food truck, a custom tailor, and a maker of reusable bamboo utensils. Chicago Volunteer Legal Services (CVLS): Under its Guardian ad Litem (GAL) program, Chicago Volunteer Legal Services arranges for the appointment of GALs to minors in guardianship proceedings. As CVLS GALs, Chapman attorneys work to ensure that the best interests of the children are represented. They interview all of the parties involved, meet with the children, and investigate the claims of each side through background checks and conferences with the Illinois Department of Children and Family Services. Once the investigation is complete, attorneys file reports that include their findings and a recommendation to the judge on the disposition of the case. Neighborhood Housing Services of Chicago (NHS): Through NHS programs, low-income working families can purchase low-interest mortgage loans. Chapman has documented and closed many of these transactions in the past few years. International Justice Mission (IJM): IJM is a team of lawyers, investigators, social workers, and other professionals that seek to protect the poor from violence in close to 20 communities across Africa, Latin America, and South and Southeast Asia. The organization partners with local entities to rescue survivors of trafficking and slavery; to bring perpetrators to justice; to help survivors of violence rebuild their lives; and to advocate for reforms in local justice systems that will keep the poor safe from victimization. More than 18,000 individuals have been assisted, and 770 criminals have been prosecuted, since 2004. Chicago Community Loan Fund (CCLF): CCLF provides low-cost, flexible financing, and hands-on assistance to community development organizations for affordable housing, economic/commercial development, and social service/nonprofit facility initiatives. Chapman attorneys support CCLF with transactional pro bono legal services. Gads Hill: A family resource center established in 1898, the Gads Hill Center develops programs that support and empower the economically and educationally disadvantaged residents of Chicago’s Pilsen, Little Village, Back of the Yards, and North Lawndale neighborhoods. Gads Hill offers a wide range of school, child-focused, and community services. Lawyers for the Creative Arts (LCA): LCA provides a wide range of legal advice and counsel to artists in a wide range of areas: corporate and general business matters; copyright, trademark, and patents; rights clearance and fair use; contract drafting, review, and negotiation; dispute resolution and litigation; nonprofit formation and tax exemption; and rights of privacy and publicity. Chapman attorneys provide legal counsel in these areas and others for LCA. Global Alliance for Africa (GAA): GAA’s mission is to address the negative impact of the HIV/AIDS pandemic in sub-Saharan Africa, primarily through programs and partnerships designed to economically strengthen families and communities in urban slums and remote rural areas impacted by the virus. These programs enable families whose husbands/fathers have died as a result of HIV/AIDS to be able to support themselves in a sustainable manner. Chapman has provided general counsel legal services to GAA and advised GAA on its tax-exempt status, affiliation with other not-for-profits in the US and Africa, and ownership of real property in Tanzania and Kenya. Dreams for Kids: Dreams for Kids empowers at-risk youth and children with disabilities through leadership and community activities. Chapman attorneys not only provide general corporate pro bono services for Dreams for Kids but also donate time as volunteers for many of their most successful programs. Living Cities: Living Cities is a collaboration between some of the world's largest foundations and financial institutions. Founded in 1991, the organization works to combine the financial resources, knowledge, and experience of its members in order to drive private markets to help improve the lives of low-income individuals and their communities. Chapman assisted with the organization's fifth and final investment under its Integration Initiative, which involved making a senior unsecured credit facility available to a local Community Development Financial Institution. Chapman attorneys represented a syndicate of financial institutions in documenting the credit facility through several iterations. Public Interest Law Initiative: Chapman and Cutler was named to Public Interest Law Initiative's 2014 Pro Bono Roster. Since the roster's inception in 2010, Chapman has made the roster every year. PILI's roster recognizes law firms and in-house legal departments for their noteworthy pro bono contributions to Illinois’ poor and under-represented. We are proud to receive this honor for the fifth year in a row. Cabrini Green Legal Aid: Chapman and Cutler was named by Cabrini Green Legal Aid as the 2012 Volunteer Law Firm of the Year. Chapman attorneys have been actively involved with CGLA for over 20 years, and have provided hundreds of hours of pro bono work to CGLA clients. Gads Hill: Gads Hill, a Chicago-based family resource and educational center, presented Chapman with the 2011 Corporate Partner Award. Chapman has supported Gads Hill since Theodore S. Chapman gave our first donation of $100 in 1922, and the Firm continues to be a regular supporter of Gads Hill through sponsorship, pro bono, and board activities. We are proud to be involved with an organization that does so much for so many. Neighborhood Housing Services of Chicago: Chapman and Cutler received the Corporate Hero Award from Neighborhood Housing Services of Chicago (NHS) in 2009. NHS was a pro bono client of the Firm at the time of the award, and we are still doing pro bono work for it today. We were humbled to receive such an amazing award from a client that assists low-income families in Chicago.